The safari cars are lined up like runners at a starting line, single-file and impatient. There is an air of expectation emanating from the vehicles, and we are ready for our first foray into Kanha National Park, hoping, yearning, for a successful safari. The driver in the vehicle ahead of us has wandered off just as the queue starts to move – we cheekily leapfrog their vehicle, to indignation from its occupants (you snooze, you lose 😊). Passing under the boomgate at the Mukki entrance gate, we are joined by a cheery park guide, and we are off. After the parched deciduous forests of Pench National Park, the evergreen forests of Kanha National Park look impossibly lush in comparison, almost a jungle instead of a forest. The light here is emerald-hued rather than amber, and the shade from the verdant canopy overhead means the afternoon feels much cooler than its 40 degrees. We arrive at a wide waterhole, where langur monkeys frolic at the shoreline, and waterbirds perch in the overhanging branches before diving for their prey in the shallows. The park’s famous barasingha, or swamp deer, dip their massive antlers to drink from the water, before posing regally for photos. We traverse the trails of the Mukki zone, one of Kanha’s four core zones. The landscape changes from luxuriant sal forest to groves of bamboo to expansive grasslands and back again, and is criss-crossed by streams and waterholes. It is prime tiger territory. TIGER!!! Our pessimistic reveries are broken by the slamming of brakes! Our guide is pointing. 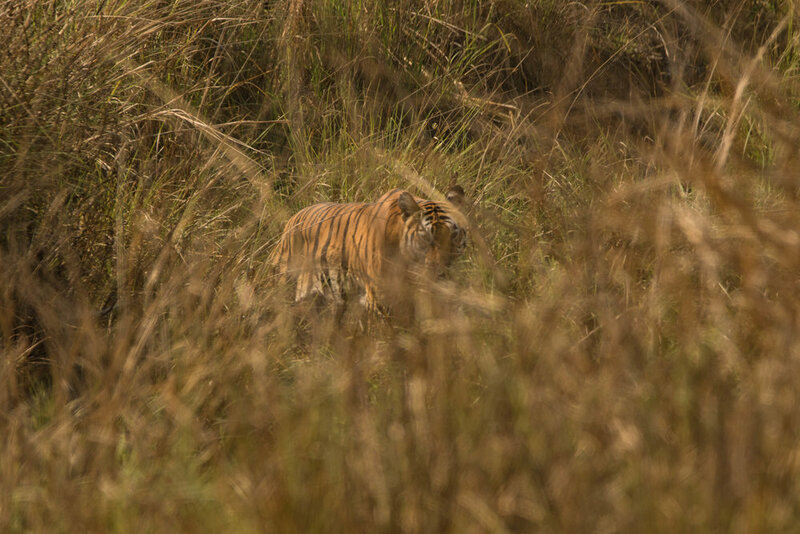 We scan the forest in the distance, eyes darting urgently to and fro, squinting into the fading light, desperately trying to see the animal before she disappears, before realising with a visceral bolt of excitement that she is right there in the reeds in front of us, just metres from our vehicle. Frantically unzooming our telephoto lenses to their widest, we take a burst of photos as she turns to momentarily glare directly at us. She is magnificent – wild and imperial – and we are awed and humbled by the experience. In a heartbeat, dejection has turned to elation. 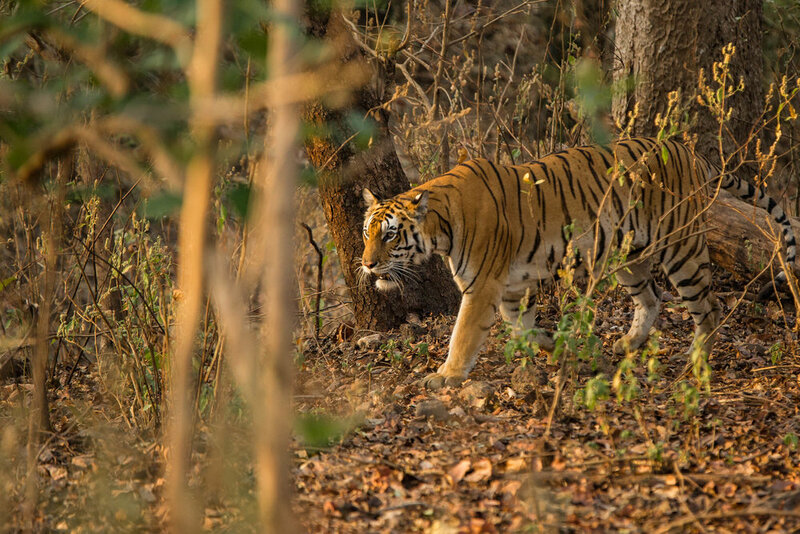 In the coming days, Kanha provides a bounty of tiger sightings. The next morning, a flock of vultures alerts us to the presence of a tiger. Our photos of her at 400mm zoom are quickly relegated to the reject pile as she then proceeds to saunter through the grassland directly towards us, emerging onto the road right alongside our vehicle. Hearts pounding at her proximity, we remember to hoist our legs back inside the jeep (they were hanging over the edge!) and watch in awe as she pads nonchalantly through the reeds and then along the trail just in front of us, her muscular haunches rippling in the sunlight. On our next outing, we come across a burly adult male chilling out in a waterhole – immersed up to his wide shoulders, he watches us watching him, but is unfazed by our presence, happily soaking in the cooling water, occasionally lapping a drink, before eventually emerging, mud-covered but refreshed. 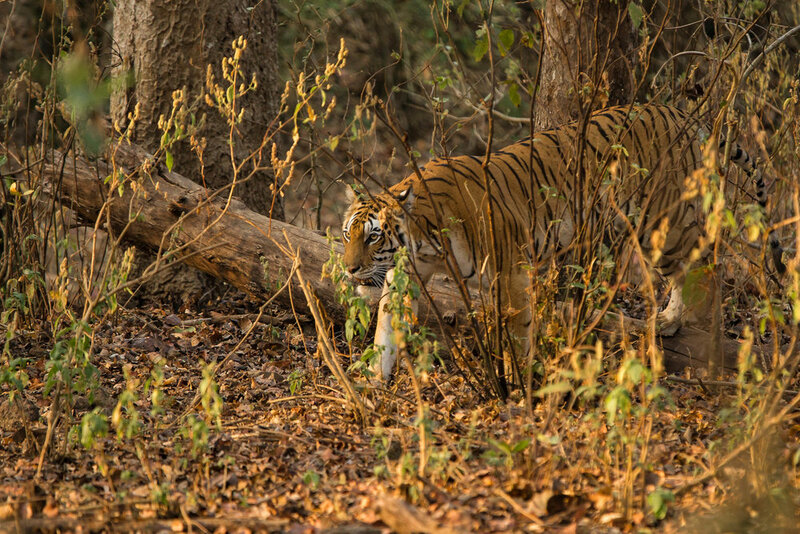 And on our final safari, there is the thrill of a successful tracking – using alarm calls of langurs and deer to alert us to the presence of a tiger, before A’s safari-honed eyesight and ceaseless vigilance were rewarded with being the first to spot the tigress lurking in the forest. Shyly, this young tigress, known for her timidity, peeks out giving us a momentary clear(ish) shot, before quietly dissolving into the undergrowth again, impressing us with the extraordinary effectiveness of tiger camouflage. 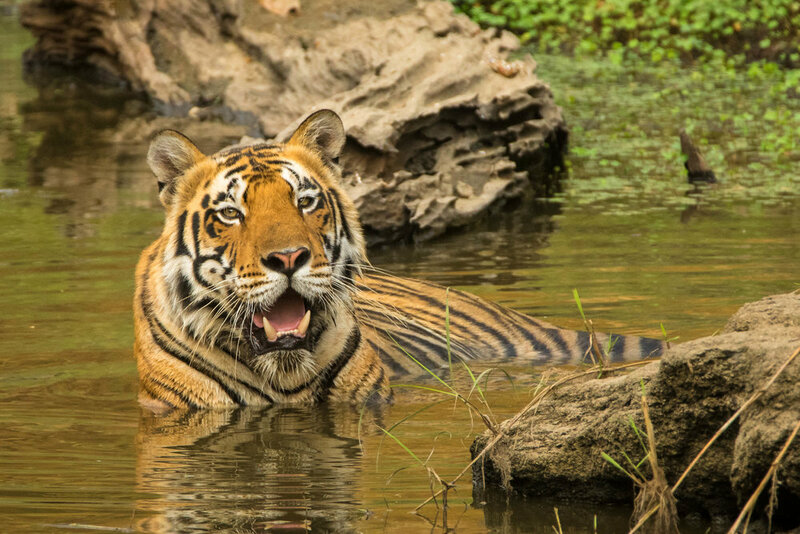 So would we recommend Kanha National Park as an inclusion on your Indian tiger safari? Unreservedly. Kanha turned out to be our most successful national park for sighting tigers (although we didn’t see leopards or sloth bears). The park is large and its scenery is beautiful, and even when not seeing the “big ticket” animals, there is still enough wildlife around to keep you engrossed. In addition, the park is well organised, with the zone and ticketing structure appearing to work well, without issues of overcrowding, or too many vehicles at any one sighting. The GPS tracking of vehicles ensures that regulations are followed by the drivers and guides, for the safety and wellbeing of both visitors and animals. And the national park guides here seemed to be the most enthusiastic and engaged (and friendly) of the three parks visited. Finally, the tourist infrastructure at Kanha is probably the most advanced of the three Madhya Pradesh parks, with signage and maps in both Hindi and English, a museum within the park, an up-to-date and impressive photo guidebook documenting the tigers of Kanha, and a number of beautifully photographed coffee-table books about Kanha available at the gate giftshop. Kanha National Park is the largest tiger reserve of Madhya Pradesh, and the largest national park in central India. It’s core area stretches over 940 square kilometres, while the surrounding buffer zone add another 1000 square kilometres of territory. Kanha is divided into four zones – Kahna, Mukki, Kisli and Sarhi. Kanha was the first zone opened, followed next by Mukki, with both Kisli and Sarhi being created more recently. In the past, most tiger sightings were in the Kanha zone, leading to the creation of “premium” tickets for that zone, but as the population of tigers has increased throughout the park, so have the sightings, and the premium zone ticketing system was abolished in 2016. There are three gates to Kanha National Park. The first is the Khatia Gate, on the western aspect of the park, near the village of Mocha. This gate enters into the Kanha zone and Kisli zone. Here, the most luxurious accommodation option is Flame of the Forest. On the southwest aspect of the park, the Mukki Gate opens into the Mukki zone, a lovely section of the park with consistently good sightings. Here the sensational Banjaar Tola lodge is just a few minutes from the gate (see our review of Banjaar Tola here). Other high-end lodgings include Shergarh Tented Camp and Singinawa Jungle Lodge. The final gate is the Sarhi Gate, on the northern border of the park, which opens into the Sarhi zone. As the most recently opened gate, there is less infrastructure here, and there is no premium lodging in this region yet. Inside the park, it is possible to cross between the zones, but the ticketing system means that you are allocated a particular zone for that safari, and are expected to spend the majority of your time in that zone. So saying, you can drive to and from your allocated zone via the other zones (rather than having to drive the long way round to that respective gate from outside the park), and if there is a sighting en route you are allowed to stop. But it should be noted that the park is large and the distances significant, so a considerable portion of the safari can be spent driving to and from your allocated zone, if it is not the zone closest to your entry gate. This is particularly relevant for afternoon safaris – in a two and a half hour safari, you could be spending one hour driving to your zone and one hour driving back, and while these are lovely drives in themselves, it does leave just thirty minutes for dedicated tiger tracking. In our experience, our lodge was able to obtain an excellent mix of safari zones, but always the closest zone for our afternoon safaris. Within the park, there is also a surprising amount of infrastructure, with huts for rangers and researchers dotted around, and in the Kanha zone there is a central meeting point with a memorial, museum and breakfast canteen. The park is open from mid-October to June 30. Each day, the park opens for a morning safari and an afternoon safari, with times varying according to the month - opening as early as 0530 in May and June and as late as 0645 in January, but always closing at 1100, before re-opening in the afternoon between 1500 and 1600, and closing for the day between 1730 and 1900. The park is closed on Wednesday afternoons. Over the course of the season from October to June, the weather in the Kanha region varies considerably. In January and February, the mornings can be bitterly cold (as low as 2 degrees!) and traversing the forest in an open vehicle can be a freezing experience. Make sure you bring enough warm clothes (including thick coats, beanies, gloves and scarves) and make sure your lodge has provided you with sufficient blankets (and preferably hot water bottles). Even in April, when daytime temperatures peak in the 40's, it is still surprisingly cold in the early mornings, and a warm jacket is still advisable. By the end of the morning safari, it is starting to get pretty warm, but fortunately Kanha has a lot of shade, and while sun protection is still highly advisable, it is not uncomfortably hot. Each morning and each afternoon, 140 safari vehicles are allowed into Kanha National Park, divided between the four zones - 45 in Kanha zone, 45 in Mukki zone, 30 in Sarhi zone and 20 in Kisli zone. The zoning system, designed to minimise overcrowding, means that not all vehicles entering at the Mukki gate will be allocated to the Mukki zone - for example, 45 or so vehicles may enter at the Mukki gate, but 20 will be allocated to Mukki, while 10 enter at the Mukki gate but head to Kisli, and 15 enter at the Mukki gate but head to Kanha. Similarly, some of the vehicles entering at the Khatia gate will be heading to the Mukki zone. This means that vehicles are not all in the same area at the same time, and seems to work well. The majority of the safari vehicles within Kanha are small open-top Suzukis, known as gypsies. These are rugged little vehicles, small and manoeuvrable, but by no means luxurious. In comparison, our lodge, Banjaar Tola, used specially customised Tata 4x4 vehicles, which were spacious and well equipped, and much more like African safari vehicles (a legacy of Banjaar Tola's association with &Beyond, one of Africa's leading luxury safari providers). These provided enough space to spread out with our camera gear, rather than having to hold everything on our laps. Don't even try to do this yourself - the national park websites are poorly designed and fraught with difficulties. All the luxury lodges will make reservations for tickets, vehicles and guides as soon as you make your accommodation reservation. Make specific requests for zones if you have them, but otherwise, you can feel confident that the premium accommodation providers have the experience to choose wisely. We would also highly recommend booking a private vehicle - while this is approximately $150 per safari, it is worth every cent for the independence it provides. 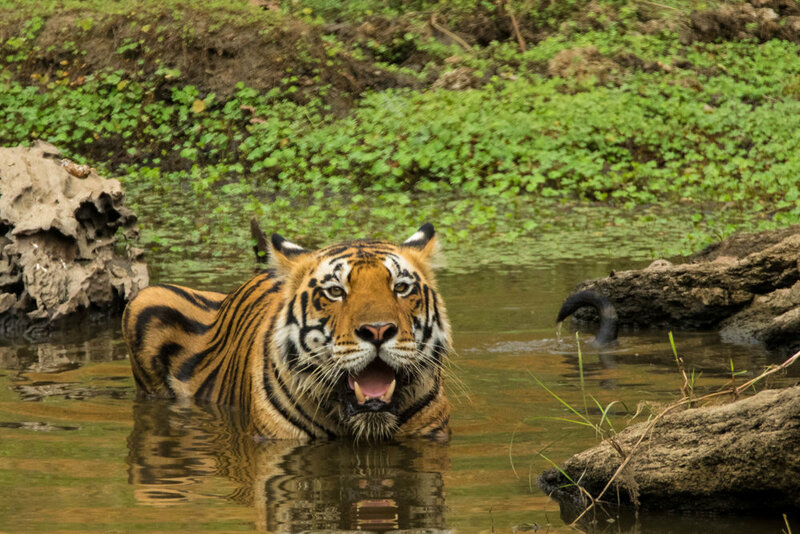 Kanha National Park has recently introduced a system of GPS tracking for its vehicles, tightly regulating their movements and speed within the park. Drivers and guides who go off-road or speed can be fined or even banned, and while this seems harsh, it has been done to improve safety and conservation within the park, and should be applauded. It may also come as a surprise to know that any electronic communication between vehicles is prohibited - guides cannot call each other or text each other with sightings or happenings. This means that if a sighting does occur, other vehicles may arrive by chance (there is only a limited number of routes within the park, and favourite tiger haunts are well known), but there is not the mass arrival of every vehicle in the park that can occur in other safari destinations. There are estimated to be approximately 80 tigers in the Kanha region, although this number varies considerably depending on which website you believe. So saying, regardless of the exact number, the tiger density in this national park is reasonable, and chances of seeing a tiger here are higher than average. The faint tell-tale sign we had been looking for. But for those of you who are familiar with African safaris, it should be noted that in India there is nowhere near the density of big cats that you will find in the national parks of eastern and southern Africa. Tigers are by their nature solitary, competitive and territorial – they rule ruthlessly over their own range. They are also often quite wary of humans. So please read our blog on realistic expectations when undertaking an Indian tiger safari. In addition to the tigers, other big mammals include leopards (hard to see), sloth bears (even harder), wild boar, gaur (Indian bison), mongoose, langurs, macaques and multiple species of deer, including the park's famous barasingha, or swamp deer - these particularly impressive deer with huge velvety antlers are one of the park's most successful conservation stories, and have recently become the park mascot. Jackal on the prowl in the early morning light. 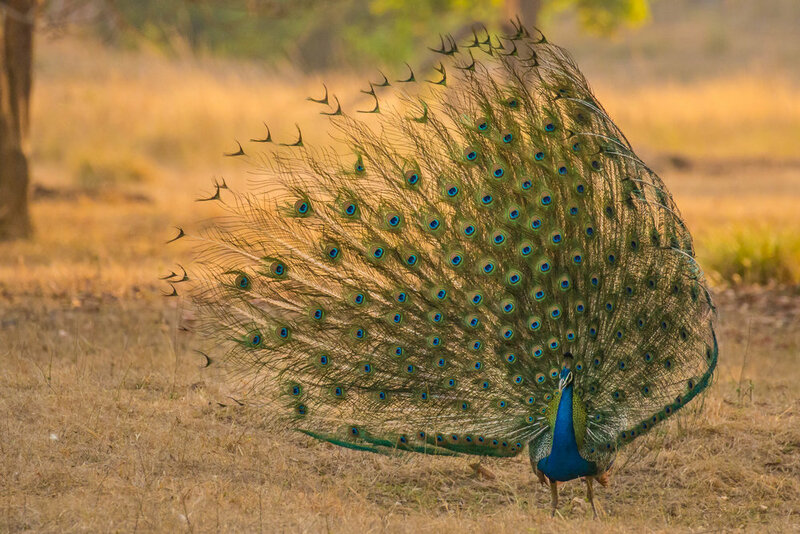 Peacock in full display mode. Not the most flattering perspective, but interesting nonetheless.